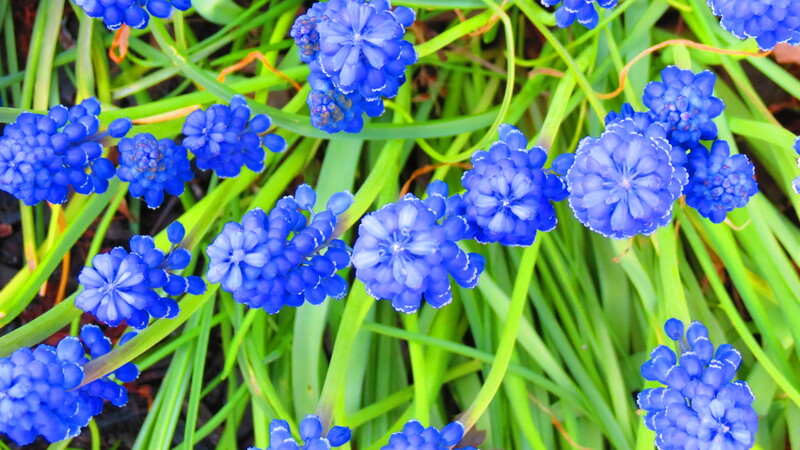 When my friend Maria presented me with a small bag of Muscari bulbs as a gift years ago, I had no idea that that would be the start of a beautiful relationship. My first thought was, “How cute. Grape hyacinths — even the name sounds petite and demure.” Nothing, though, could be farther from the truth. 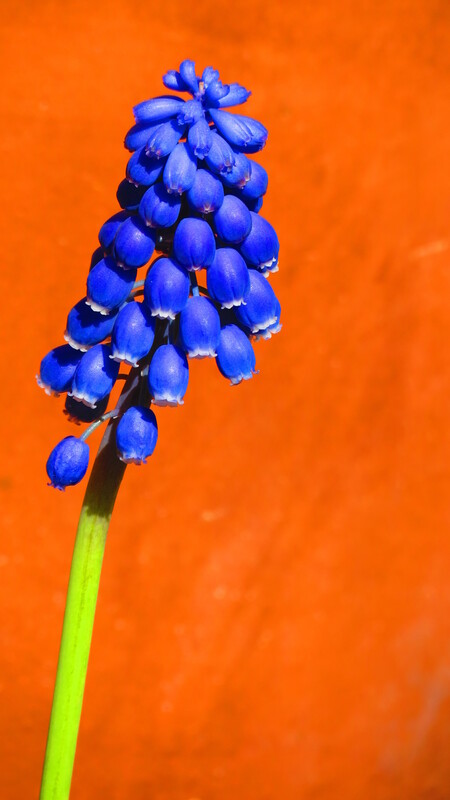 Muscari is a wicked, wicked temptress of a plant — small in size but gi-normous in attitude. That small bag of 10 bulbs has multiplied and naturalized easily, making itself at home in nearly every bed. I don’t even remember planting bulbs in certain locations — and now the plants are overwhelming long-established perennials. 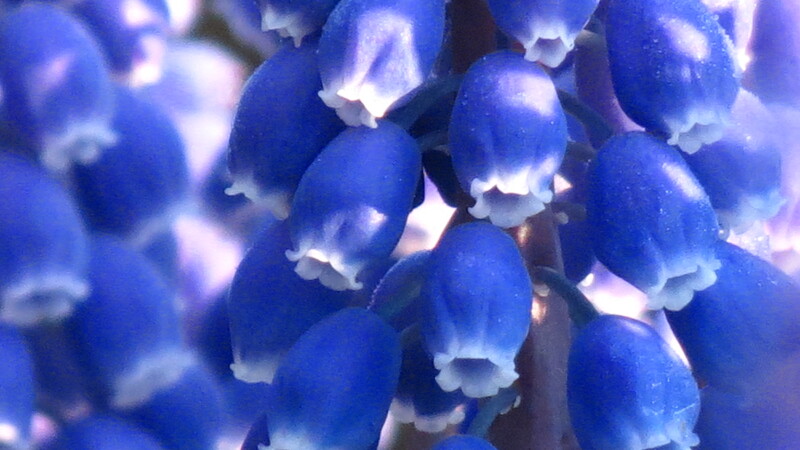 But I don’t care — because I’m truly, madly, and deeply captivated with Muscari. That thought occurred to me the other day when my plan was to get down and dirty with elephant ears and I instead found myself in the heart of a Fellini film. 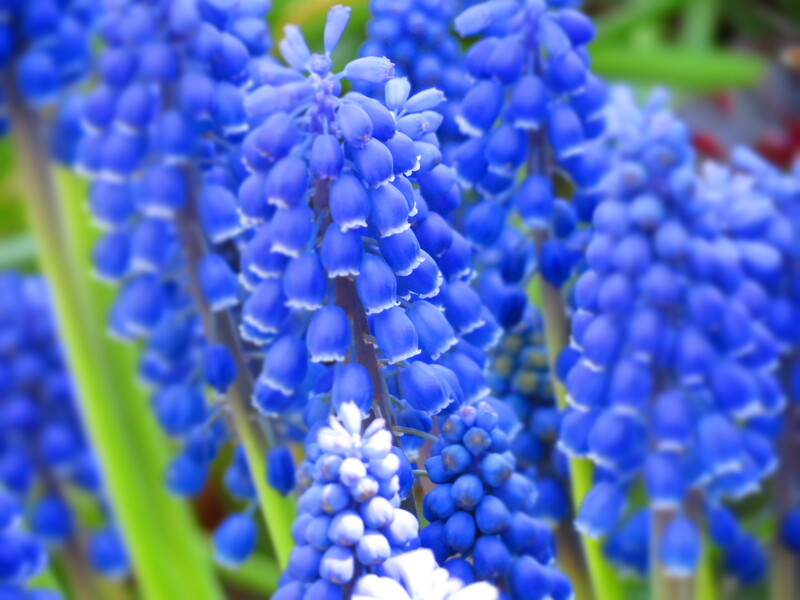 I’m a member of the paparazzi, completely enamored with Muscari, a seductive garden siren swathed in violet. 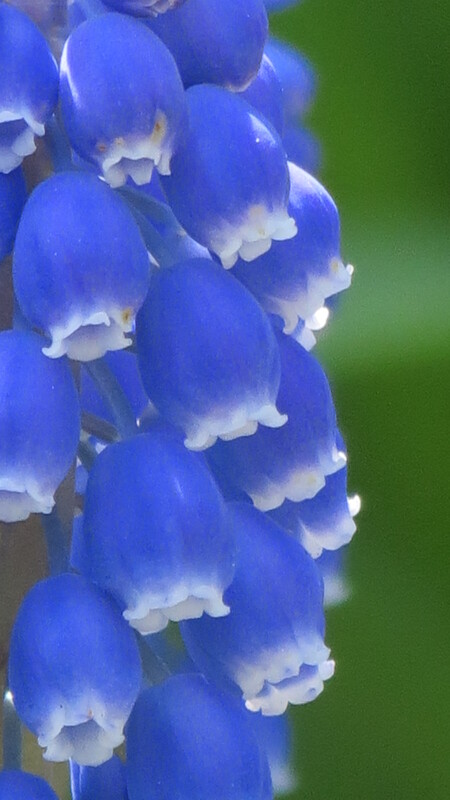 From sunrise to sunset, Muscari begs to be photographed. Part of my attraction is the name itself. Some plant names demand to be repeated over and over again — softly whispered, perhaps? — because, well, they’re fun to say. Portulaca is one, and now there is Muscari. Italian, it seems, makes everything sound better. I mean, would you ever want to plant a bed of anything if it was called — I don’t know — Voldemort? More than anything, it’s the color that grabs my attention. I know there are white varieties and various shades of blue, but it’s the deep color that holds me. Bathed in light or cloaked in shade, the blue is sometimes as blue as the Aegean Sea, sometimes more cobalt-colored, and sometimes purple. 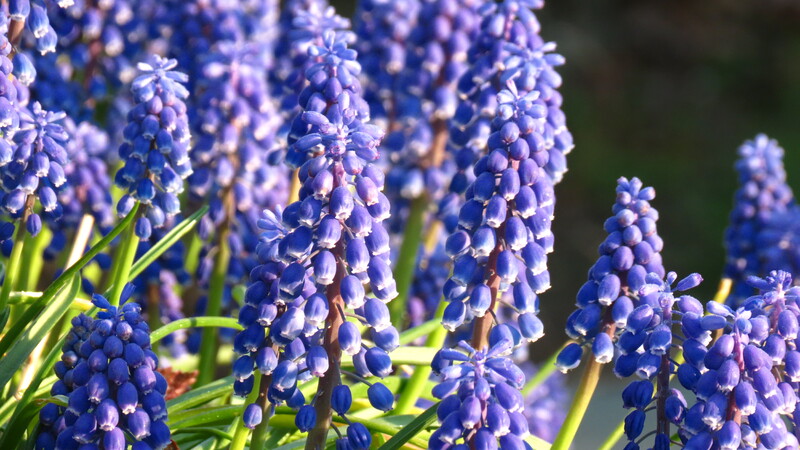 With each subtle change in the light of day, Muscari becomes more appealing. Then there are the flowers themselves. Each Muscari stalk resembles a Dr. Seuss-inspired tree. On closer inspection, the pearl-like blooms look like juicy, puckered blueberries — or scandalous blue-dyed pantaloons. And when this close, you can’t help but smell the sweetly perfumed scent. Yes, Muscari knows all about living la dolce vita. Not a chance. It’s amore! Hi Diane. My hyacinths are gone for the season, but the muscari are still holding on. Super easy to grow and a big show once they naturalize. The photos, in particular the closeups, are fantastic, Kevin. I can only imagine how gorgeous the real thing must be! I know hyacinths, but these are definitely exceptional. I’ve never even heard of Muscari, but I love how they’ve proliferated. I don’t know if they’d do well in our climate, but I’m curious. As an example, I’ve grown tulips before, but they literally can bloom and die in one day–that’s hard to take! I may just need to really enjoy yours. 🙂 BTW, I’m so glad you have your GoodReads on your blog. I just love seeing what others are reading. Hi Debra. I wonder if muscari would do well in your area. They’re easy to grow — just plant the bulbs 3″ down and nature does the rest. In my area, the grassy foliage emerges in fall, stays green through the winter, flowers throughout spring, and then browns up for summer. Just remove the dead stuff and the process starts all over again. My only wish for Goodreads is that I had more time to read. 🙂 Be well! Yes Its amazing that these teeny tiny bulbs are so hardy and so beautiful. I’ve tried different varieties but the basic blue old fashion ones are the most long lived. 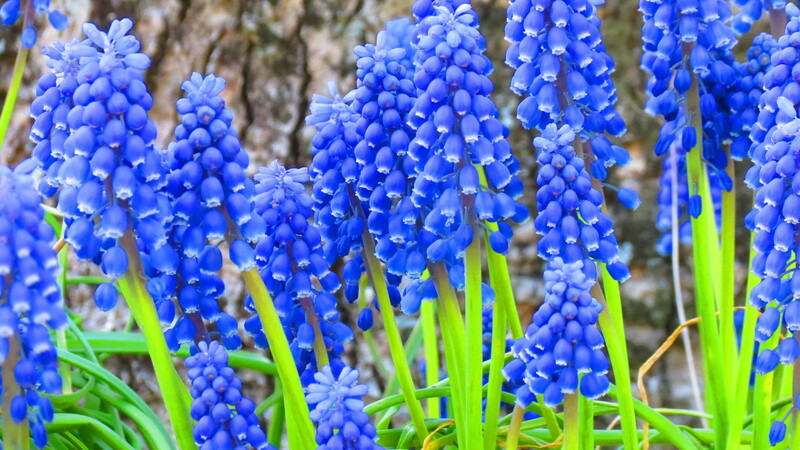 I love the grape hyacinths! I’ve found a similar passion for the small tulip species (that all the fancy tulips were hybridized from). The bulbs are small and cheap, they naturalize wildly, and – rather than having that stalk that needs to be left, yet hidden, these tulips lay right above the ground, like water lilies on the surface. Muscari, common iris and specie tulips are the ones for me. I think these earthy varieties beat out the fancier hybrids in many ways. So happy to know others appreciate their beauty too! I love them too, they are everywhere in my garden but I don’t mind ! They are so beautiful. I can see why you are so crazy about them! Great post. These are absolutely gorgeous! Wonderful pictures. I’m so glad you liked them. I actually surprised myself with that last photo. Deine Makroaufnahmen gefallen mir besonders. Ich liebe die kleinen, immer zufriedenen Traubenhyazinthen auch sehr und habe viele im Garten. Hi Anette. Danke schoen. I’m sorry that it took so long to respond, but I’ve been trying to translate your comment from whatever I can remember of my high school German. Your first sentence gave me some trouble, but it’s nice to know we have the same taste in plants and that you have so many in your own garden. Be well! I’m giggling at the idea of planting Voldemort, what about Dumbledore 🙂 Ok maybe not!